Neil Jacobs: I was born in Cleveland, Ohio, and grew up in the little town of Hinckley, which is most famous for the buzzards returning every March, which is somewhat analogous to the Swallows of Capistrano - but not exactly. Now I reside on the shores of Lake Michigan in Western Michigan, where I am appreciating the calmness and natural beauty of the area. In the past, I have resided in numerous countries, as well as numerous cities throughout the USA. mwe3: Your 2014 CD The Peasant Sabbatical, the song of which is also the lead off title track, features you recording with several musicians. Who plays with you on that track and the album overall, and how do you feel the title track sets the tone for the album and how did you arrive with the title? Neil Jacobs: Elizabeth Blickenstaff does a very nice job on the violin, as well Sid Omasta on upright bass. 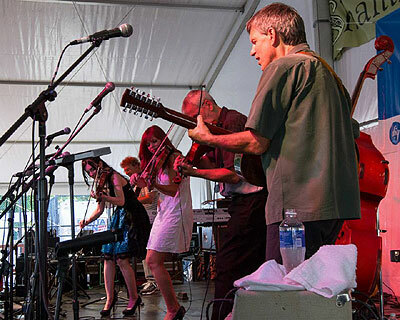 They complete the central trio of instruments in The Peasant Sabbatical. This is the first time that I have worked with them on one of my CD projects, and was quite pleased with the result. Due to financial and travel restrictions, I was not present for much of the recording. Fortunately, this is the first project where I completely scored the music prior to recording, and Craig Markley did a great job as engineer. Often we had to communicate by telephone during sessions while I was on the road. The Peasant Sabbatical is a tongue in cheek description of my journey. I like to refer to the Peasant Sabbatical as one that you embark on willingly, and without the assurance of a guaranteed reward. At one point we toyed with using the tarot Fool Card to represent the CD, meaning that the peasant sabbatical was undertaken with naiveté and perhaps misplaced confidence. Many of my travels were serendipitous, and certainly off the beaten path. mwe3: Tell us about working with producer Craig Markley and recording at Lone Raven Studios. Who else was did you work with during the creation of The Peasant Sabbatical? Neil Jacobs: Craig played a major role in keeping the project on track, and was flexible working around my travel schedule. We are both perfectionists, and brought varied perspectives to the project. Craig demonstrated amazing patience and steadfastness, as well as making the most of a modest studio setting. He also added some touches of other instruments such as accordion, bawu, percussion and low whistle. In the past, my prior CD projects were less produced, and were more intended to reflect an actual performance,. It was interesting for me to have the songs reflect some additional production. His daughter, Kara Markley, also added some nice violin on the harmony parts. mwe3: You were mentioning that youre recording truly global on this CD, while so many artists all over the world are espousing the Americana sound these days but I can see The Peasant Sabbatical having wide ranging appeal. Track 2 on The Peasant Sabbatical, Moj Dilbere (My Darling) has influences from the Balkans. How and when did you become so influenced by music from that part of the world as most people probably couldnt find it on the map! 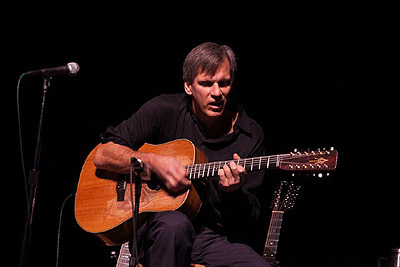 Neil Jacobs: Americana seems to be an area of major focus in acoustic music today, and there are a lot of great artists recording some wonderful music in that expanding genre. Unfortunately, (or fortunately) that is not what interests me musically. 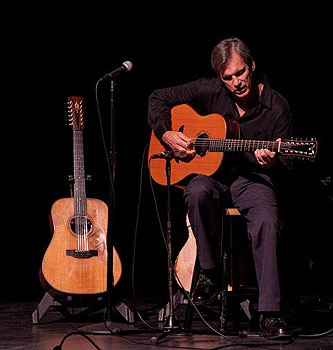 I have always been comfortable taking a different approach musically, and I suppose adopting the 12-string guitar as my primary instrument was the starting point. Many of my previous CDs, such as Cold Fish, American Gypsy, and 12-String Guitar certainly are good examples of not following the crowd. I believe there is a rich tradition of music from the Balkans and Eastern Europe, with a remarkable confluence of musical styles and cultures with instrumentation that has been underrepresented in American music. Many of the songs I chose have interesting histories going back centuries, and have timeless subjects. mwe3: Track 3, Amish Autumn harks back to America but in a kind of strange way as its based on a massacre of Amish children in 2006. How did you come across that story and was it a haunting topic to work around? The song also features you on both 12 string and mando-cello. How well does that sound work as a team and how do you balance the two instruments in one track? Neil Jacobs: Something about that story touched me. I dont know why, with so many other terrible tragedies in the world. Perhaps it had to do with innocence, and helplessness, and unbelievable forgiveness displayed by the Amish community. I am drawn to the deep dark richness of the mando-cello. I was looking to add a sinister edge in the background, and the mando-cello fit perfectly. It is an instrument that you feel more than actually hear. Amish Autumn was one of those songs that was written in a few minutes in its entirety, which is quite rare for me. mwe3: What instruments did you feature on the CD and were there different guitars or stringed instruments featured? Have there been any new developments in the guitar world for you? Theres a great picture of your guitars on the back cover of the CD booklet. Can you mention a few of those instruments? 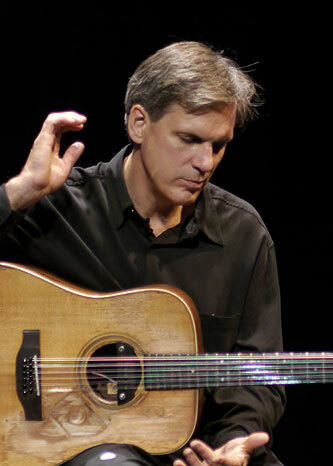 Neil Jacobs: My main guitar was the James Goodall 12-string. I also used my iconic 1975 Alvarez Yairi on Niska Banja. This was my original 12-string guitar which is pictured on all my promotional materials and discs. I also played a 1917 Gibson mando-cello, an authentic macedonian folk tambura, and a collection of tamburitza instruments including a G brac, G prim, and D prim. mwe3: The Klezmer influence appears on Itchikil. How big an influence is Klezmer on you and does that music have roots in the Eastern Europe sound? Klezmer seems to be quite a long lasting genre. Neil Jacobs: Admittedly, I have little knowledge of Klezmer music, perhaps because it doesnt translate to the 12-string guitar readily. I became fascinated as of recently, after performing with the Klezmatics at the Carnegie Hall (the one in Pittsburgh). The version of the frailach, Itchikil, from the Peasant Sabbatical CD is perhaps just the beginning of me delving into this rich music tradition. However, reviews of the past CD, American Gypsy have surprisingly cited Klezmer influences in the music. mwe3: Night Of The Nestinari was inspired by Bulgarian fire dancing. What is that, did you witness it, and how did it influence that song? You mentioned that track is related to another track on your 2010 CD 12 String Guitar? Do you sometimes revisit earlier tracks or revise them / rerecord them? Neil Jacobs: I participated in UNESCOs Balkan Youth Reclamation Program in Bulgaria soon after the war, which allowed me the opportunity to experience some of the music and culture of Bulgaria. One of the stops along the journey was where I witnessed the remarkable barefoot fire-dancing ritual in Southern Bulgaria. I originally introduced this tune as The Llama and the Dragon on the solo 12-String Guitar CD, but it truly had its roots in Bulgaria with the nestinarvo. 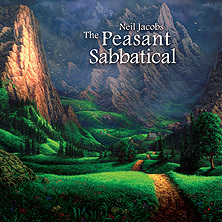 The Peasant Sabbatical allowed me to orchestrate it a bit, letting the melody be carried primarily by the violin. mwe3: Last Cocek In Sarajevo is kind of exotic sounding. Whats the story behind that track? When was it written and what was it like performing in Sarajevo after the Balkan war? When was that, and was there a real danger of you getting killed at that point? Neil Jacobs: An accordionist on the Zivili tour introduced me a similar piece of unknown origin. I have rearranged it extensively. We performed a version of this Cocek on the final stop on our Refugee Camp Tour at a major concert event in Central Sarajevo soon after the war. The concert was performed on a massive stage with a corresponding grand sound system constructed only hours prior to the concert amidst the rubble of the inner city. At that time, Sarajevo was still in shambles, with the danger of land mines remaining off the walkways. At the concerts conclusion, and even before we could exit the stage, the city square was cast into complete darkness for the remainder of the night, leaving us helplessly wandering in the darkness. I never really felt like I was in grave danger, but then again, I had become somewhat numb to the chaos and danger, after weeks of traveling by bus through numerous destroyed towns and villages in Croatia and Bosnia. 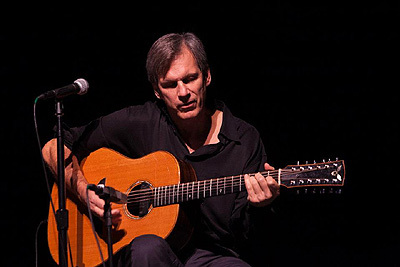 The Cocek as a music and dance form has a fascinating history, and is especially challenging on the 12-string guitar. mwe3: Jiffy Jig is very short and has Celtic and Balkan influences. How would you compare the Celtic and Balkan influences on your music and that track? Neil Jacobs: This is another formerly solo guitar piece that I added an ensemble to fill it out a bit. I am told by Celtic aficionados that it is not really a jig, which I concede is probably true, so therefore I was free to to add tamburitza, violin, and swing bass. I think the tamburitza sound compliments this quasi-pseudo-Irish jig. mwe3: Can you tell us about your finger technique in both left and right hand techniques you use? 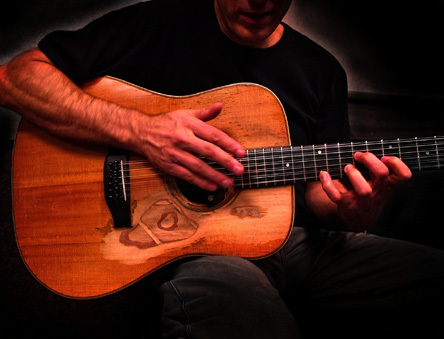 How hard was it to master the acoustic 12 string and do you have a 12 string electric? Do you still practice guitar? 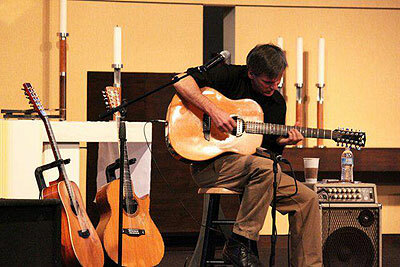 Who are your favorite 12 string guitarists, both acoustic and electric? Neil Jacobs: From my youth on, I really never copied other guitarists, or for that matter listened to other guitarists very often. This is probably due to fact that I was quite shy, lacked confidence, and therefore was easily intimidated. Secondly, I had no innate ability or interest for imitating others playing styles. Needless to say, there are so many great guitarists, that one could spend a lifetime emulating them. I just went my own way. Following one year of basic lessons, from then on, I essentially was self taught. I studied troubadour harp later which lead to me inventing my signature circular strumming technique on the 12-string guitar, which as far as I know has not been copied, although I wouldnt be surprised. I can date it to a recording in 1978. My finger-picking style utilizes all five fingers. At the time I was ignorant of the fact that using the pinky was not an orthodox style. When I am not finger-picking, which is most of the time, I use a a paper thin nylon pick, and try to play bass percussion, lead, and harmony simultaneously... as effectively as possible. I am for the most part, what most guitarists have commented on, a right-handed guitarist. mwe3: U Stambolu na Bodforu (Istanbul On The Bosporus) has some interesting liner notes! Is the lore and mystique behind these stories fascinating to you? It is amazing the folklore associated with some of these tracks. How do you balance the 12 string and tamboura on these tracks? 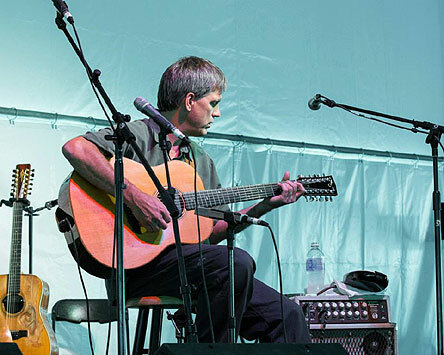 How and when did you start playing tamboura and Craig Markley adds some great accordion. Your guitar work sounds like a bouzouki on this track! Neil Jacobs: It was great fun researching the song lyrics and themes of much of the music. The Sevdah music tradition involves a rich confluence of musical traditions including Sephardic, Turkish, Balkan, Gypsy, etc. The lyrics are often dark emotional love songs, with non PC subject matter. I tried to print out some examples within the liner notes of the CD to give the listener a flavor of the themes to the music. The tambura (or sargija) is one of my favorite instruments from the region. It is basically a wooden two course bouzouki-like instrument, perhaps just slightly less harsh than a Greek bouzouki with only two double courses of strings. One set is a drone, so you are left with one set to play the melody. Needless to say you have to learn to move quickly in a linear fashion playing it. I learned the tambura while touring with the Zivili music and dance ensemble. I attribute my exposure to a lot of the music from this region to my years performing with Zivili. The guitar style is another minor rhythm guitar invention where I tremolo the bass note on the beat one, and strum the chord on beat two. Its nothing fancy, but it compliments other tremolo-ed instruments such as the mando-cello and the tambura. Craig adds some nice touches on the accordion to give the song some nice color. mwe3: The intro and main track of Kolo Macabre Waltz features a kind of Gypsy music influence. Its unusual in that you adapt it to both Balkan music and a Gypsy music flavored waltz tempo, which you add is almost never done. How does Gypsy music fit into the mix of music on The Peasant Sabbatical? Neil Jacobs: The word kolo is a Balkan word for dance. Macabre refers to Dance Macabre from the Gypsy influenced music of Camille Saint-Saens of the 19th century. The waltz is a romantic form of dance music, so I guess it all fits together somehow. This was originally written as a dark waltz on solo 12-string guitar. The addition of violin brightens and romanticized it a bit, but it was inspired by a long refugee camp bus excursion through the Balkans immediately following the war. It is an interesting piece that perhaps has strayed from its original intention. mwe3: Track 11 Cross At The Mostar Bridge an original track and is a showcase of the album. Discussing that track, you related how you toured performing at refugee camps in the Balkans. What year was that and what was that like and how do you feel that experience impacted your musical vision and composing? What do you feel was the real cause of that war and how has the area recovered since then? Neil Jacobs: This song attempts to convey some of the experience of witnessing the aftermath of the war in the Balkans utilizing the historic Mostar Bridge as an example. I deliberately drew on the tamburitzas to form the background orchestra, and let the 12-string guitar and the dark mando-cello carry the melody. In the aftermath of the tragic Balkan War of the early 1990s, I embarked on a tour performing at refugee camps and orphanages throughout the Balkans with the Zivili music and dance ensemble. After the final concert in Sarajevo, I decided to leave safety of the tour group, and travel through Bosnia to the sacred visionary town of Medjugorje, and then on to the formerly besieged coastal city of Dubrovnik. Along the way, I encountered the bombed out fractured city of Mostar, where the bus line terminated on the Bosnian Muslim territory, separated by the remains of the destroyed iconic Mostar Bridge that once proudly spanned the Neretva River. In order to connect with the bus terminal on Croatian side, one needed to weave a trail between the gaping craters of once majestic mosques and cathedrals, around menacing tanks, and over a precarious temporary cable bridge, in order to continue on the journey. The reasons for the war is a complicated subject, with varying opinions depending on which group you are consulting. The conflicts are centuries old, and involve language, culture, religion, and ethnicity. I taught a course at a University in New York touching on this subject, and suffice to say, it is a historically rich topic, but not easily summed up in a short interview. mwe3: Niska Banja is another Serbian dance tune. How did you find that track and how did you structure the arrangement for the six players on that track? It seems to be the most freewheeling of all these songs. Neil Jacobs: This is a classic Serbian dance tune in 9/8 often accompanied by some bawdy lyrics, see the CD liner notes. The title translated means the bathhouse in Niska, Serbia. This is clearly not the classic arrangement of Niska Banja, but I had a lot of fun with the instrumentation. mwe3: Home Again closes The Peasant Sabbatical. It almost sounds like a glad to back home track after all the world music on this amazing CD. Tell us about the halcyon duende guitar style you mention in the liner notes. It seems very relaxing and clearly the most Americana of all the tracks here. Neil Jacobs: This song was practically an afterthought composed while in the studio. We recorded a take, and then Craig thought we should try a second take just in case... To our surprise they were exactly in time, so it became unison 12-string guitar duet with a natural crystalline shimmer. The term halcyon duende originally comes from a review of an earlier CD, either Secret Places or World Blue, where these two words were combined to describe my music. I had to look them both up in the dictionary. Halcyon is a special word for calm, peaceful, tranquil. Duende is originally a Spanish word for charm or enchantment. I like the feeling I get when I imagine those words used together. I have been traveling 30 years or more in some fascinating and anxiety provoking situations, and it is nice to come home and rest. This song might also provide a hint at my next CDs focus. mwe3: The beauty of The Peasant Sabbatical is that, being all instrumental, it will sound fascinating to everyone in every country. How can you reach out to people and get them to hear your unique perspective on what is truly world music and quite timeless music? Do you receive airplay in many countries around the globe? Where would you like to take your music next and I can only hope, at some point, youll be playing this music live for guitar fans far and wide. Neil Jacobs: As an independent artist, it is a daunting task to take on too heavily the promotional aspects of the music business. There are only so many hours in the day, and I like to spend as much time with the creative process of music production as possible. That being said, I am planning to concentrate more energy promoting this CD than I have in the past, as well as getting this CD into the hands of people who have a passion for non-typical music that often falls through the cracks. In the past I have received airplay in numerous countries, and my aim is to honor the music of the cultures that I have drawn inspiration.